Was proudly displayed over the front door of the Bridge Street offices. 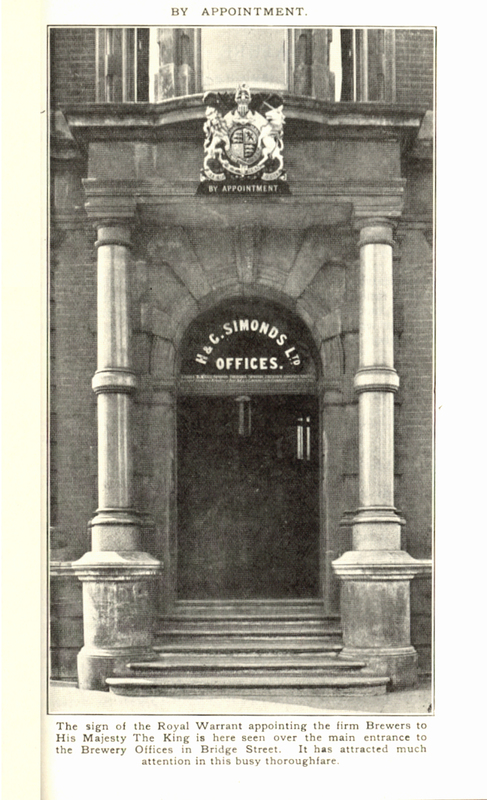 In 1929 H&G Simonds was granted the Royal Warrant as Brewers to His Majesty, King George the Fifth, from King George 6th in 1940 and from Queen Elizabeth 2nd in 1955 and continued to hold the warrant until its demise in 1960. Board minutes of 1938 show that there was much displeasure at the loss of the Buckingham Palace account after 50 years in 1938 but satisfaction that the Windsor Castle account had been retained.